Well, it finally happened...I've gone digital! I have been fascinated lately by digital art. It used to be looked down upon by fine art painters and not allowed in competitions, but lately it has gained a new respectability and is much more abundant. 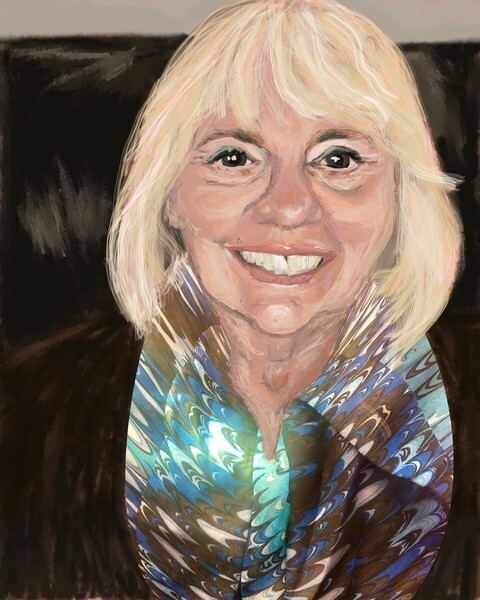 I wanted to learn how to use Procreate, after seeing some wonderful digital art on Sktchy, so I took a short class from Lisa Fillion, a Canadian teacher, It was a four part class and Lisa's teaching style is clear and easy to understand, so I took great notes and practiced as we went along. I love the ability to use different kinds of brushes to add layers without affecting other layers and to add patterns, among other things. No messy paints, no wasted materials...its cost effective, And the best part? You can save the images as JPEGs and share them or print them out (over and over) on your own color printer. I'm so excited, I dream about doing the next piece before I even touch my sylus to my I Pad. So, take a look at my portfolio, where I have uploaded a few pieces. Meanwhile, here's a new self-portrait I did in Procreate, to show you what I'm talking about. OK, so I have always considered myself a landscape painter and when asked about portraits, I always responded that "I'm not very good at portraits; they're hard". So, I decided a couple of months ago that I needed to practice drawing and painting faces. 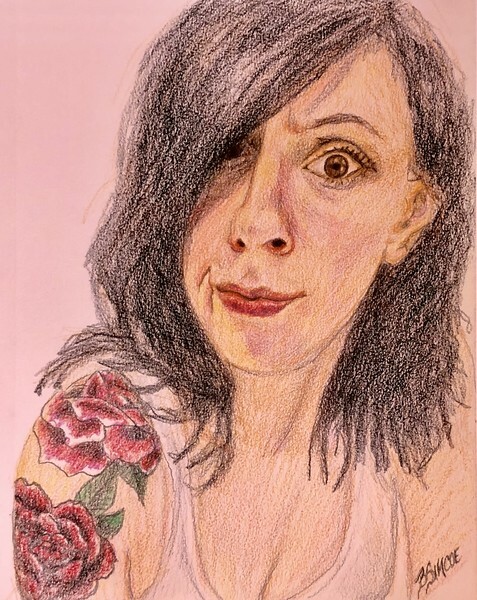 I found a fantastic site, called Sktchy, where people post selfies and other shots they have taken and allow other Sktchy artists to use them for reference. What a goldmine! Besides offering up "Friday Faces', the site also offered a couple of online classes. The one I chose to start with was "30 Faces in 30 days". What a great way to immerse oneself in portrait work! There were online demos and suggestions for stretching your comfort zone from visiting artists and a Facebook page for sharing the results. It was a fantastic experience and my portfolio has benefited from the experience. Also, I am more apt to say now, when asked, that I do OK with portraits. I'm not afraid anymore and, although I still have some issues with certain portions of a person's face, I have much improved. I would highly recommend the site to anyone who wants to learn more about portrait painting , as well as the 30 day challenge as a way to learn quickly what works and what doesn't. I heard recently that injuries to the neck & wrist have increased due to our extensive use of electronic devices. Everywhere we go, we see people engrossed in their cell phones or tablets. Its definitely a sign of the times. In an earlier blog, I spoke of the access to reference photographs that the internet provides; often photographs that are posted by friends grab our attention. 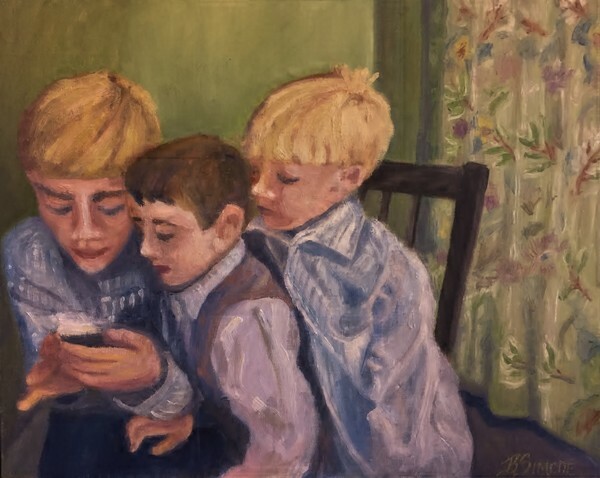 That was the case with the reference photo I used for a recent painting of three boys looking at a cell phone in the eldest boy's hand. My friend, Fran posted it and I asked her, immediately, if I could use it for a painting & she agreed. It reminded me of Vermeer's paintings, where light from a window was a key factor. In this case, however, even though there was a window in the room, the light that is key to the three figures is from the cell phone. To me, it represents our times & the ever increasing devotion to electronic devices. Isn't the Internet great? Not only does it provide artists with a multitude of marketing opportunities, but it also provides access to millions of reference photos. My Facebook friends are always travelling to exotic places & as they go, I find shots of theirs that I find inspiring. so, I ask if I can paint them and they almost always comply. 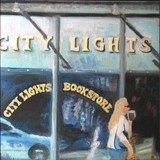 I might get a sale out of the finished piece & I might not, but either way, I have a new painting that I enjoyed doing. Facebook even has some sites that provide copyright-free photographs by amateur photographers who are willing to let painters use them for inspiration. That's how "Dancing with jellyfish" came about. I found a couple of shots of someone's grand-daughter at an aquarium on one of those sites. 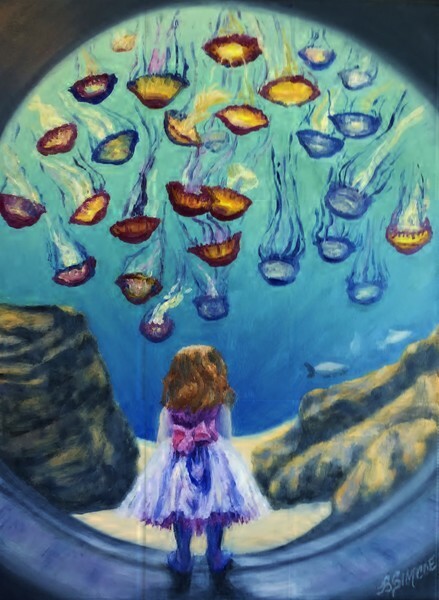 Then I researched jellyfish and found a very colorful group that I liked. So, I put both together for the painting. I love the way the girl's fancy partyy dress mimics the floating jellyfish. Don't you? Now I know why Georgia O'Keefe was so fascinated with skulls and used them as the centerpiece in many of her paintings. My grandsons have dirt bikes and quads, so we were all out on Arizona State land (in Pinal County, near the Pinal Air Park) a few weeks ago. They sped around, kicking up dust during the day and camped with their folks in their pop-up trailer at night. I came for the barbeque lunch and some plein air painting. While walking back to the campsite from my special potty spot, I nearly tripped over the bottom jaw piece of this skull. When my youngest grandson saw it (he loved it, of course), we went back to the spot and, together, found the rest of the skull. It was gross....with some fur still stuck to the chin...ick. But, as the grandmother of three boys, I'm getting used to gross. So, I took it home, boiled it and bleached it, then mounted it on my old I Pad case. Before mounting it, I took a bunch of photographs, knowing this was going to be the last time I had it in my hands. Cleaned up, it was amazing! I loved the shades of gray and ivory, the smooth versus the jagged edges, even the teeth and the cracks. I decided to paint it against scenes from the area. 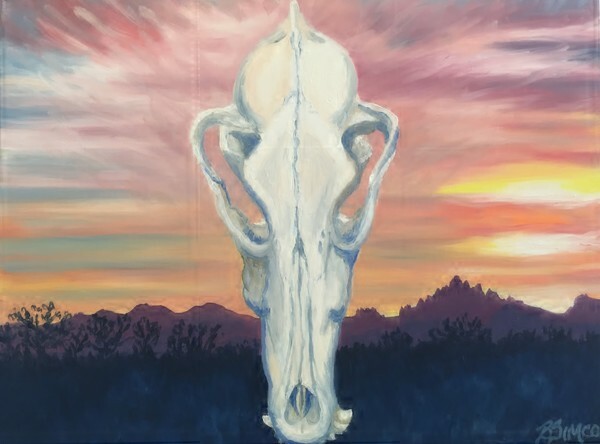 The first one was the skull from above with the sunset and the distinctive local mountains as the background. The second one, in a portrait format, instead of landscape, was of the skull with Picacho Peak behind it. (Picacho is a famous landmark here in southern AZ.) I think of them as a pair. I hope to do more, as soon as I figure out what to pair with the other angles. I enjoyed painting the first two very much. My daughter calls them Southwestern Pop Art. I hope they would make Georgia proud. Facebook brings us closer to our friends and family and sometimes forces us to share their losses, as well as their happiness. My friend, Dani, recently chronicled the slow, agonizing passing of her older dog, Hunter, whose illness had progressed too far for any hope of prolonging his life. It was painful to watch. 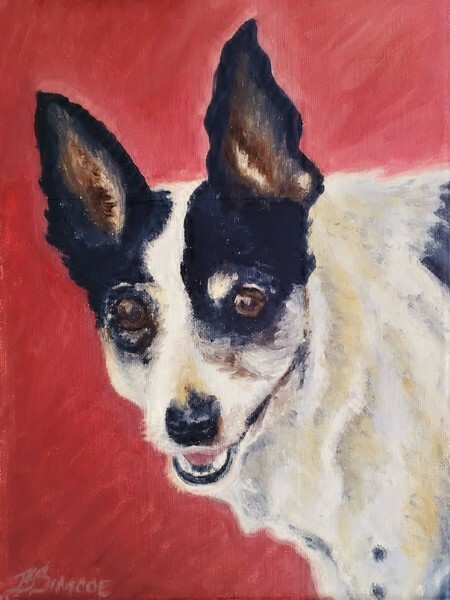 I messaged her and offered to paint her a portrait of Hunter, if she would send me her favorite photo, which she did. I manipulated the contrast & colors a bit so I could paint Hunter's tribute. It was a bit of a challenge with so much black and white, so I had to get some variety in there to make it an interesting painting. What struck me the most, as I enlarged the new photo in order to paint the details, were Hunter's eyes. I could actually see the depth there and what looked like two people reflected in his eyes. So, I painted the eyes very carefully, knowing full well that they were the door to his animal soul - the soul that this family really loved. It was a big responsibility, but one I think I fulfilled and Dani's tearful thanks were enough payment for this particular portrait. Now, her family will have a wonderful reminder of Hunter forever. In August, I travelled back East, to see my family. While there, we went to Ontario, Canada, where my family has had a cabin on Centennial Lake since before it was a lake. When they started going up there in the 40's, it was on the Madawaska River. My Dad, who is in his late 80's now, unearthed some old photos of a sawmill and dance hall that used to be located on the river, near Camel Chute rapids. Before heading north, he and I repaired the photos, using Photoshop, with the intention of sharing them with some of the locals, who now have a great website about the area. He didn't want to simply upload them (which he could do, by the way); he wanted to talk to someone and hand them to a human being who would appreciate them. So, one afternoon, we visited the local hall that houses the website, but found no one around. We did talk to a guy who was out mowing someone's lawn, though, and he happened to know the woman who ran the organization and he directed us to "that big house, up on the hill, near the boat launch". My Dad knew right where it was, so we drove there and he and my brother rang the bell. While they were inside "the big house on the hill", delivering his photos, I admired their great lawn, which overlooked the boat launch and a small bay. I took some photographs, including the one that lead to this painting. When I got back to Arizona, I manipulated the photo and painted this 12 x 24", oil on canvas with gallery-wrapped edges. It's full of saturated color - quite the opposite of the old sepia black & white photos we delivered and it's not about boats on the water, either. So, it really flips two concepts at once. Thank you to my ex-husband, Ridge Tolbert, who came up with the perfect title - "Bottoms up". 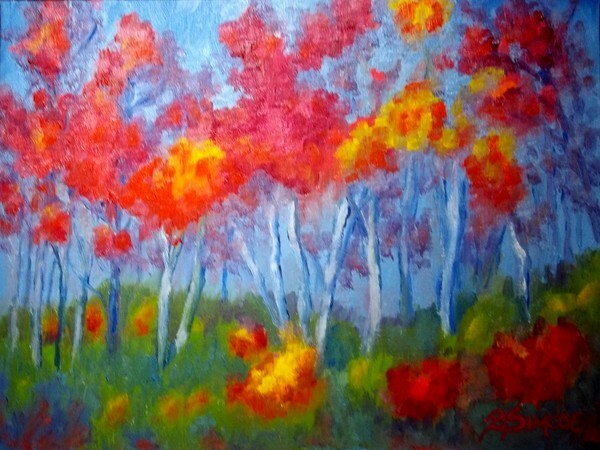 This latest little beauty is called "Neon Trees". It is based on a mid-values photo taken from a speeding car in Italy...looked nothing like the final product in real life. However, I shoot loads of reference photos when I travel to use later, in a case like this. I took the photo and used a editing software to hype up the colors and contrast. Then, I painted it with water-based oils, on a 12 x 16" canvas board. It was an afternoon project that took me back to one of my more pleasant travelling experiences and even though you can't tell it's Italy, I know it is and it brightens my mood every time I look at it!